Simple Mail Transfer Protocol (SMTP) is a protocol used to send and receive email between mail servers. Email relays are typically used by larger organizations to distribute a high volume of mail to a number of internal mail servers. You can use Anti-Spam’s SMTP relay for this purpose. You configure separate SMTP relays for incoming and outgoing email. 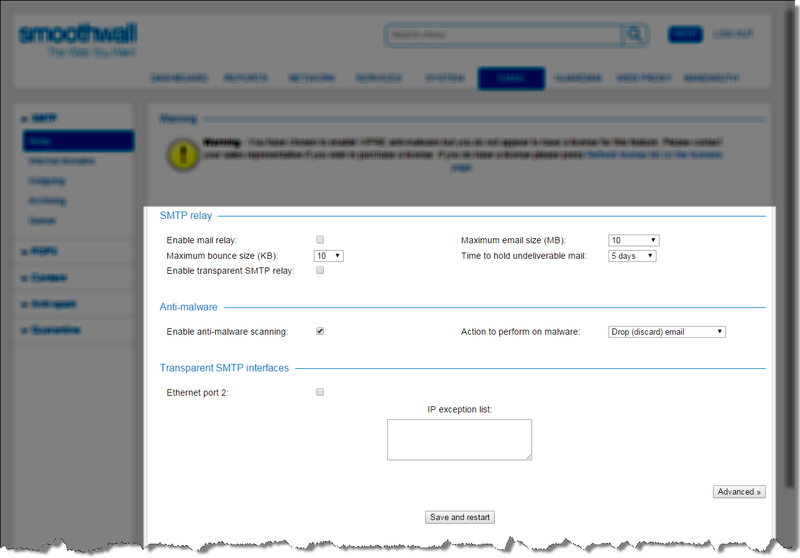 Before you configure Anti-Spam’s SMTP relay, you must configure your Smoothwall to allow traffic through to the relay. 1. Go to the System > Administration > External access page. 2. Add an external access rule for the following Service — SMTP (25). 1. Go to Email > SMTP > Relay. • Enable mail relay — Select to activate relaying after configuring incoming and outgoing relaying. • Maximum email size — Used to specify the maximum email size, in megabytes, that Anti-Spam accepts. Any email above this limit are rejected. • Maximum bounce size — Specifies the maximum size of an email, in kilobytes, which is used in a bounce email. • Time to hold undeliverable mail — Used to specify the amount of time an email is held in the queue if it cannot be sent. Anti-Spam periodically attempts to re-send all email that is held in the queue. • Enable transparent SMTP relay — Capture outgoing email and relay it through Anti-Spam. • Interface name — Specify which interface(s) SMTP traffic will be transparently captured from. • IP exception list — Enter any IP addresses, subnets or ranges that should not be transparently proxied. • Use system hostname — Select this option to use Anti-Spam’s SMTP hostname when relaying email. • User defined hostname — Select this option and enter a different hostname to use when relaying email. 6. Click Save and restart to reboot your Smoothwall. Anti-Spam can scan relayed email for malware and take appropriate action as specified by the anti-malware settings configured. • Enable anti-malware scanning — Activates anti-malware scanning for relayed email. Discard the email, without notifying the sender or intended recipient. Return the email to the sender, along with a warning message. Send a warning email to the recipient, with the original email as an attachment. Allow the email to be delivered, and the malware will be logged. 3. Click Save and restart to reboot your Smoothwall. By default, Anti-Spam attempts to deliver all outbound email directly to the appropriate server. You can configure Anti-Spam to relay all outgoing email to another mail relay. • Enable relay host — Select to enable Anti-Spam to send outgoing email to another relay within an existing email infrastructure. • Relay host — The IP address or hostname of the relay. • Username — The username, if required by the remote relay. • Password — The password, if required by the remote relay. 4. Click Save and restart to reboot your Smoothwall. Non-standard SMTP checking options enable Anti-Spam to check email which does not adhere to the SMTP message format and contains badly formatted or bogus information about the sender and recipient. Note: In order for the non-standard SMTP checks to work, Anti-Spam must be operating as the MX record for the recipient domain. To alter your domain's MX record, you will need to access your domain’s DNS server settings. Refer to your email server documentation or your email provider to find out how to alter the MX record. It should be set to your Smoothwall’s external IP address. • Use strict HELO checks — Ensure validity of the initial communication between a connecting SMTP client and the Anti-Spam email relay. • Sender domain validity — Check that the sender domain is formatted correctly and has a real IP address. • Recipient domain validity — Check that all recipient domains are formatted correctly and have real IP addresses. • External sender domain spoofing — Check if the sender of incoming email is falsely using an internally relayed domain in their from address. Emails are rejected if the sender’s email address purports to be from a domain listed on the incoming page, but the sender’s IP address cannot be found on the outgoing page.